This is a car that doesn’t need fuel and releases nothing but water from its tailpipe, but it’s no mere flight of fancy. Toyota started production of the Mirai hydrogen fuel cell vehicle (FCV) in March 2015, and the zero-emissions machine is now sold across the world. 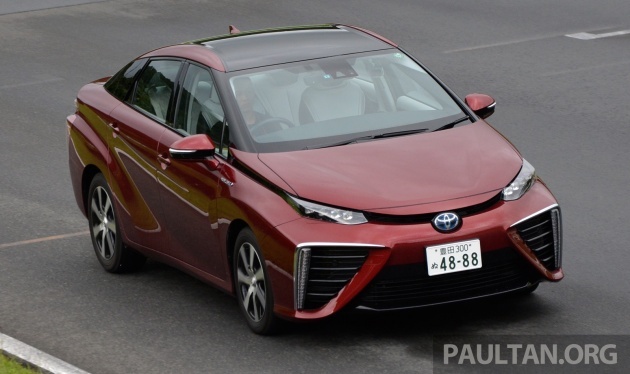 Toyota has big plans for the Mirai and clearly sees hydrogen fuel cell vehicles as “the future of driving,” even as its market leading hybrids hold the fossil fuel fort today. The big T seems to be skipping conventional electric vehicles, even as rivals – most notably Renault-Nissan – put their eggs in the EV basket. The carmaker’s focus on the environment is a main theme of the ongoing 2016 Toyota Technology Media Event in Japan, and the Mirai, as Toyota’s most advanced production car, is a star exhibit. The FCV, which has a 650 km range in Japan’s JC08 cycle with one tank of hydrogen (or 502 km in the more realistic US EPA cycle), is currently on sale/lease in Japan, the US and Europe, where it’s available in the UK, Germany, Denmark, Belgium, Norway and the Netherlands. Toyota officials at the tech event told paultan.org that they sold 700 units of the Mirai worldwide last year, and that this year’s target is 2,000 units. The target will then climb to 3,000 in 2017. From there, the Japanese giant must be expecting a substantial rise in interest in FCVs, as the plan is to sell 30,000 units of FCVs globally per year by 2020. That’s just four years from now. What will be the great catalyst? Prices will tumble over time, like how it did for hybrids. There could also be a smaller (and therefore cheaper) version of the Mirai in the vein of the highly-successful Prius c/Aqua, and/or the growth of hydrogen station infrastructure as the tech gains critical mass. Currently, there are only 90 locations to fill up an FCV in Japan (it takes just three minutes to refuel a Mirai), but this number is set to grow. While electric car range anxiety does not affect FCVs (the Mirai’s range betters many regular ICE cars), refuelling is a hurdle. Toyota, Honda and Nissan are currently working together to develop hydrogen station infrastructure domestically. In addition to partially covering the operating costs of hydrogen stations, Japan’s big three have also agreed to help infrastructure companies deliver the best possible customer service and create a convenient refueling network for owners of FCVs. The initiative is supported by the Japanese government, which has set 40k FCV sales by 2020 as a target. Will the target by both Toyota and Japan be met? No one will be betting big against Toyota, the company that has sold over nine million units of the Prius in less than two decades. 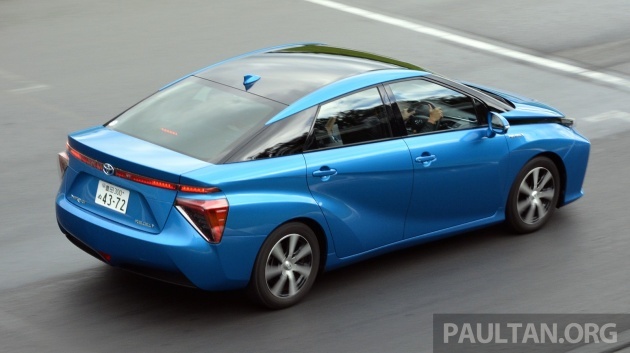 The trailblazing Mirai could very well be the Prius of tomorrow. Good technology but as usual fail in design.Hopefully other carmakers will come up and copy this and design better.Qualification to become TMC designer must be just uni dropouts.So pay lesser salary & higher profits annually. It may be an awkward design but the focus on this car is not about the design. This car is design in such a way to ensure maximum air intake and streamline as much air as possible while driving. Because it is a hydrogen powered car, it needs plenty of oxygen intake. Anyways it is actually pretty good looking to me. Don’t simply say uni dropouts la. You so clever you go design la. I will get get this beauty when it comes to Malaysia. Who will be interested in purchasing a car that costs far more per mile to drive than an EV? By 2020 Tesla and GM, possibly other companies, will be selling long range EVs that will cost far less than the Mirai to purchase and much, much less per mile to drive. what happen to toyota nowadays? sack the designer! Good technology, bad design! Just fit the tech into an Altis and sell leh. Of course mod a bit, add sunroof… and put some green/blue emblem. If battery tech improves faster than they can build H2 infrastructure – looking like they will – H2 power would be relegated to powerstations. Paint this car black and it will look very much like a Darth Vader mobile.